Another condition, Stevens–Johnson syndrome (SJS) also presents similar dermatological characteristics and is often misinterpreted with TEN. Literature review shows that, although SJS and TEN demonstrate the same attributes, they differ regarding the severity and body surface area (BSA) involvement. Out of the two, SJS is less severe (10% BSA) in comparison to TEN which involves more than 30% BSA. Mortality among the patients with SJS and TEN is approximately, 10% and 50%, respectively. Several theories have been postulated to explain the pathogenic mechanism of TEN which involves the activation of immune-medicated cytotoxic reaction leading to the destruction of keratinocytes. Clinical assessment of patients with TEN involves the use of severity of illness score for toxic epidermal necrolysis (SCORTEN) – a severity of illness assessment score which assesses the parameters such as age (>40 years), presence of malignancy, epidermal detachment (>30%), heart rate (>120 beats/min), serum bicarbonate (<20 mmol/L), serum urea (>10 mmol/L), and glucose level (>14 mmol/L). One point is awarded for each parameter, and sum of all points determines the probability of mortality. Patients suffering from TEN are frequently treated in a specialty wards, intensive care unit, or burn center. Early treatment for TEN involves the immediate withdrawal of alleged drug and initiation of supportive therapy. This case study highlights one such incident of adverse drug reaction in which TEN was observed by the use of carbamazepine which was prescribed for the management of epilepsy. 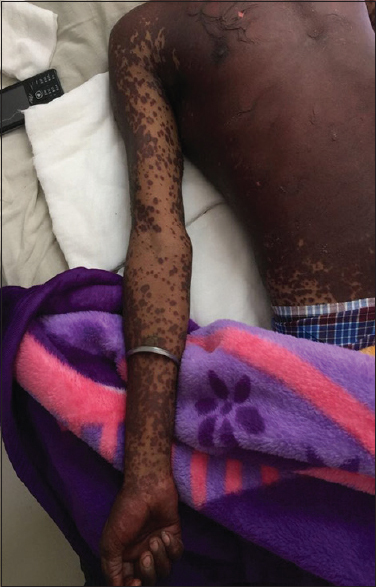 A 22-year-old male came to our hospital with complaints of fever, throat pain, and skin reaction associated with itching all over the body for 1 day. It was discovered that the patient was a known case of seizure disorder (for 3 years) and was well maintained on tablet clobazam (30 mg twice a day). Due to the increased frequency of seizures from the last 4 days, he visited the regional hospital where he was prescribed with tablet carbamazepine (1 tablet – 200 mg TDS). Personal history of the patient revealed that he developed extensive skin lesions few months ago due to the ingestion of carbamazepine. However, at the time of consultation at regional hospital, the patient and his caregiver did not mention about the history of allergic drug reaction and sequentially when he was restarted on carbamazepine, the patient suddenly developed severe allergic reaction after administration of a single dose. Followed by that, the patient came to the dermatology outpatient department of our hospital for consultation. On general examination, he was found conscious and well oriented to time, place, and person. General physical examination was found within normal limits. On admission, temperature was 99.7°C, pulse rate was 90 beats per min, while blood pressure was 110/78 mmHg. Cutaneous examination revealed multiple tiny vesicles all over the face (perioral, periorbital, pinna, forehead, cheeks, and chin), erythematous papules with targetoid lesions on neck, upper limb (chest, abdomen, and back), and lower limb [Figure 1] and [Figure 2]. Nikolsky's sign was also positive [Figure 3]. Based on the patient's past medical history and current investigations, the patient was diagnosed with carbamazepine-induced TEN. Additional laboratory investigations revealed an increase in the aspartate aminotransferase and alanine aminotransferase levels (127 and 109 u/L, respectively). After admission in dermatology ward, tablet carbamazepine was stopped immediately, and the patient was started on injection (Inj) dexamethasone (2cc OD), injection azithromycin (1 g OD), injection pheniramine maleate (2cc BD), injection ceftriaxone (1 g BD), tablet clobazam (10 mg BD), and tablet sodium valproate (300 mg BD). Slowly and steadily, the erosions began to heal with reepithelialization. He was discharged after almost 15 days of hospitalization with topical lotion containing propylene glycol and shea butter. On follow-up visit, after 1 month, the postinflammatory hyperpigmentation was observed over chest, back, abdomen, upper limb, and lower limb. Overall, he recovered well without any complications. SCORTEN score for this patient was 2. To assess the causal relationship between the drug and reaction, Naranjo's causality scale was used by which score obtained for TEN was “7” which fall under the “Probable” category. TEN is unusual but fatal dermatological disorder which occurs most commonly by the use of certain group of medications. A case of TEN was first illustrated by Debre and colleagues in 1939. Later on, in 1956, Lyell proposed the name TEN (also known as Lyell syndrome). A systematic review by Patel et al. reported an overall incidence of TEN to be 34.09% (120/352) among the Indian population. Furthermore, antimicrobials, anti-epileptics, and NSAIDs were found to be the major cause of SJS/TEN. Numerous epidermal and mucosal changes occur during TEN. The clinical pattern of TEN is divided into three phases including prodrome, acute, and recovery (reepithelization). Prodrome phase is comprised symptoms such as fever, loss of appetite, headache, rash, and pain in joints and muscles, as well as several upper respiratory tracts infection symptoms such as cough and pharyngitis. Further, after few days, erosion of epidermis, flaccid bullae, and ulceration in the oral cavity occur which are presented as an acute phase of TEN. Nikolsky sign is also observed during this phase of a condition. Gradually, within 2–3 days, the whole affected skin becomes denuded. In this phase, similar signs can also be observed in oral cavity, ocular, and genital sites depending on the severity of illness. Finally, after 3–6 weeks, the reepithelization may progress with steady healing over the skin followed by mucosal sites.,, In TEN, multiple organ sites (ocular, pulmonary, cardiovascular, gastrointestinal, and renal) are affected with the erosion of mucocutaneous membranes. There is no standard treatment protocol available for the management of drug-induced TEN; however, withdrawal of an suspected medication is the first step in its management as it may reduce the chances of death. Masking of epidermal destruction can be done by paraffin gauze, xenografts, allografts, and Biobrane – a substance comprised synthetic bilaminar membrane. Many studies recommend intravenous immune globulin (IVIG) as a safer alternative for TEN management but still few studies have reported negative results. Overall, the evidence to use IVIG is yet inconclusive; and additional clinical trials are necessary to establish its clinical effectiveness. Similarly, the use of corticosteroids in TEN also has mixed conclusions, though it is considered as the best option in resource-poor settings. Other management strategies include the use of plasmapheresis, TNFα inhibitors, N-acetylcysteine, and cyclosporine. Numbers of clinical studies have established a fact that carbamazepine is one of the potent inducers of TEN. Carbamazepine is frequently prescribed to the patients with epilepsy, bipolar disorder, and trigeminal neuralgia. A retrospective study conducted by Devi et al. reported 53% (22/41) incidence of SJS/TEN by the use of anticonvulsants among which carbamazepine was found responsible in 44% of all cases. Review written by Patel et al. demonstrated that about 18.25% of patients suffered from SJS/TEN by the use of carbamazepine. In addition, several scientific studies highlighted strong association between the HLA-B*1502 and carbamazepine-induced SJS/TEN., Results of the study conducted by Aggarwal et al. among North Indian population found that HLA-B*1502 was present in 22.2% of the study population in comparison to the control group. Furthermore, the study recommends testing patients for HLA-B*1502 before prescribing carbamazepine for any indication. In the case of TEN, mortality is predicted on the basis of SCORTEN score which in our patient was 2. A retrospective study conducted by Barvaliya et al. concluded that the higher SCORTEN score at a time of admission is directly proportional to the mortality rate. It is recommended that the SCORTEN score should be calculated for the first 5 days of admission to determine the mortality rate more precisely. The causal relationship between the drug and adverse reaction was found “Probable” in our case. Similarly, a case report published by Laskar et al. also reported causal relationship as “Probable” (Naranjo's causality assessment score-7) between the carbamazepine and TEN. This case is unique in its way as the patient had a history of SJS before a year due to the administration of carbamazepine. The reason for developing such a severe reaction was simply the hypersensitivity toward carbamazepine, which can be considered as an example of a medication error that can be easily prevented. Some of the measures to prevent this can be the use of allergy card by the patient as well as the patient and caregiver should be counseled for the condition from which he was suffering and explained about the medications that can lead to severe reactions after ingestion. The prescriber should also focus on the allergy profile of the patient and should consider the HLA screening before prescribing carbamazepine. The biggest limitation for screening patients for HLA is the cost of a procedure and time involved in it. A computerized database of patients with such dermatological reactions and economical testing facilities can further help in prevention of such life-threatening conditions. Schwartz RA, McDonough PH, Lee BW. Toxic epidermal necrolysis: Part I. Introduction, history, classification, clinical features, systemic manifestations, etiology, and immunopathogenesis. J Am Acad Dermatol 2013;69:173.e1-13. Huang LY, Liao WC, Chiou CC, Lou JP, Hu P, Ko FC, et al. 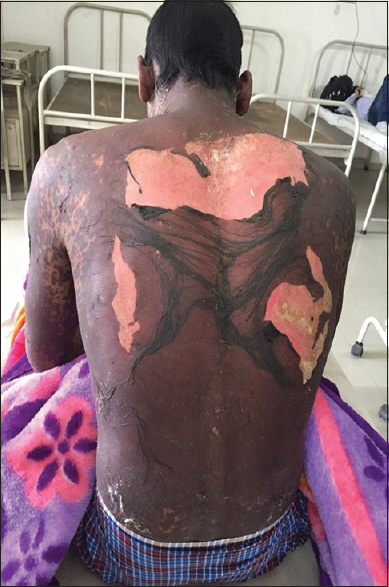 Fatal toxic epidermal necrolysis induced by carbamazepine treatment in a patient who previously had carbamazepine-induced Stevens-Johnson syndrome. J Formos Med Assoc 2007;106:1032-7. Mockenhaupt M. The current understanding of Stevens-Johnson syndrome and toxic epidermal necrolysis. Expert Rev Clin Immunol 2011;7:803-13. Bastuji-Garin S, Fouchard N, Bertocchi M, Roujeau JC, Revuz J, Wolkenstein P, et al. SCORTEN: A severity-of-illness score for toxic epidermal necrolysis. J Invest Dermatol 2000;115:149-53. Schwartz RA, McDonough PH, Lee BW. Toxic epidermal necrolysis: Part II. Prognosis, sequelae, diagnosis, differential diagnosis, prevention, and treatment. J Am Acad Dermatol 2013;69:187.e1-16. 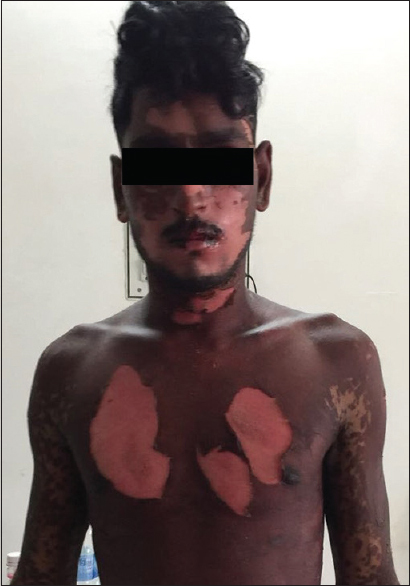 Patel TK, Barvaliya MJ, Sharma D, Tripathi C. A systematic review of the drug-induced Stevens-Johnson syndrome and toxic epidermal necrolysis in Indian population. Indian J Dermatol Venereol Leprol 2013;79:389-98. Devi K, George S, Criton S, Suja V, Sridevi PK. Carbamazepine – The commonest cause of toxic epidermal necrolysis and Stevens-Johnson syndrome: A study of 7 years. Indian J Dermatol Venereol Leprol 2005;71:325-8. Aggarwal R, Sharma M, Modi M, Garg VK, Salaria M. HLA-B*1502 is associated with carbamazepine induced Stevens-Johnson syndrome in north Indian population. Hum Immunol 2014;75:1120-2. Devi K. The association of HLA B* 15:02 allele and Stevens-Johnson syndrome/toxic epidermal necrolysis induced by aromatic anticonvulsant drugs in a South Indian population. Int J Dermatol 2018;57:70-3. Barvaliya M, Sanmukhani J, Patel T, Paliwal N, Shah H, Tripathi C, et al. Drug-induced Stevens-Johnson syndrome (SJS), toxic epidermal necrolysis (TEN), and SJS-TEN overlap: A multicentric retrospective study. J Postgrad Med 2011;57:115-9. Laskar JI, Chakravarty P, Dewan B. Toxic epidermal necrolysis induced by carbamazepine: A case study. Asian J Pharm Clin Res 2017;10:78-81.